Being on holidays can sometimes be a great chance to catch up on the sleep you’ve missed the rest of the year. To stay in bed luxuriously long, then gracefully rise to greet the day. So if you’re setting the alarm for 4:30 in the morning, it must be for something really special. In the case of the El Tatio geysers in the Atacama desert of Chile, the early hour was more than worth it. The geysers were about a two-hour drive from our hotel, and they’re most spectacular in the cold air of dawn before the air warms up and the mist disperses. Thus, the early morning wake up call. This is the kind of adventure you hire a guide for. The roads to the geysers are terrible, and the idea of navigating them at night is unimaginable. As we slowly climbed the winding roads, some of us slept, but I gazed into the impossibly black sky that was punctuated by the brightest stars I’ve ever seen. The geysers lay at an altitude of 4200 metres, and I could almost feel the air getting cooler and thinner as we traversed the hairpin turns uphill. 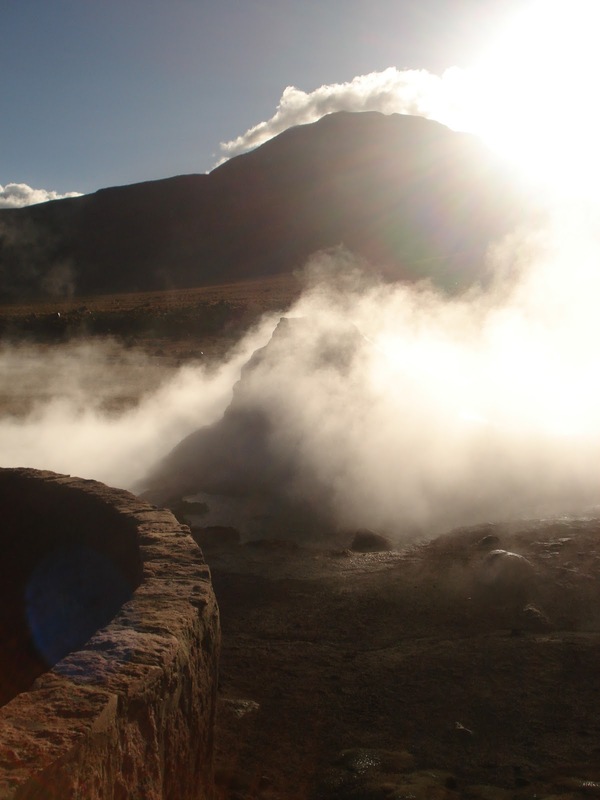 El Tatio is home to 8% of the geysers in the world. 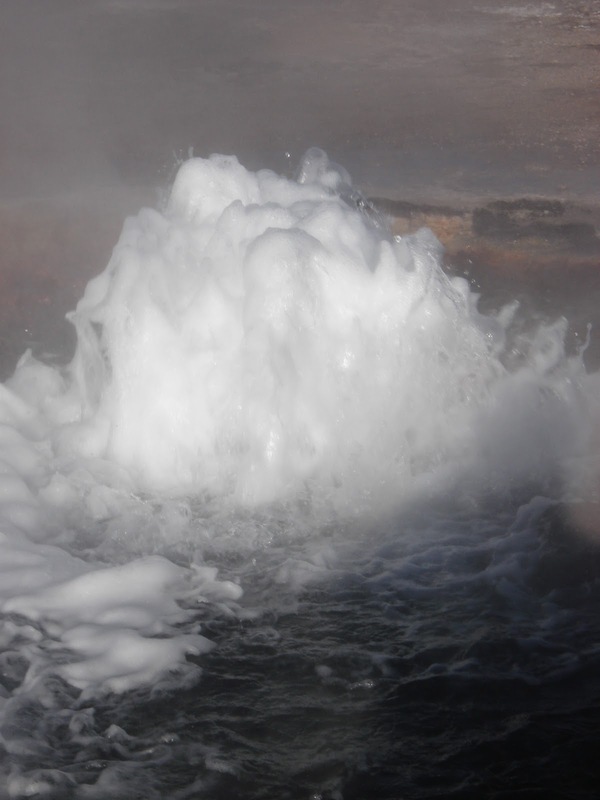 And it was amazing to walk from one geyser to the next – gingerly, because the ground is fragile in places. If there’s one thing you don’t want at 7:00 in the morning, it’s a geyser bath. When we arrived, our guide Veronica put some tetra packs of chocolate milk into one of the geysers, which we later enjoyed as hot chocolate with our breakfast. From some vantage points, it felt like we were watching the fountains at Versailles, except these were bursts of hot water and steam gushing into the air. Some of them erupted, some bubbled, but being in the midst of this field of geysers felt ethereal, like we had stepped into a land of our imaginations. A land where a variety of heavenly beings might emerge from behind the next column of steam. Surrounded by the misty air, drifting from one geyser to the next, we could have been in the middle of a Monet landscape. And as the sun rose, we witnessed an ever-changing view of these wispy miracles. Oh, how exciting and beautiful! I can only imagine – these photos are unreal! Truly amazing and beautiful, Beth. Nature is both frightening and awe-inspiring. These photographs are beautiful, Thanks for sharing! Stunning shots! Love the Geyser Hot Chocolate. What fun! Wow. Remarkable. I hope that we get back to this kind of travel someday … your photos are making my bucket list longer!! I would set an alarm for 4:30 in the morning to see a sight like that–and I am decidedly not a morning person. Gorgeous! That sounds like an amazing way to enjoy hot chocolate. I feel like I have never "experienced" hot chocolate. What beauty you have conveyed – the natural world astounds. You have been on some truly remarkable adventures! That is some unique hot chocolate that you were able to have:) Great photos! Another wonderful trip. I enjoy reading about your travel adventures. We went to Yellowstone a couple of years ago and set the alarm to get up early to see the animals. Well worth the 5 am wake up call. Beth your writing is as awe inspiring as the photos. I'm amazed at how powerful they look. I bet they were hot. It's a good thing you didn't get too close. Wow. You got to see all that AND have hot chocolate? I'm uber jealous. Such an exciting tour to have taken us along on! Such beauty! What beautiful photos of a wonderful experience! Hi Beth, I just popped over from Joanne DeMaio's Whole Latte Life blog. You have a beautiful blog here with amazing photos and stories! I think you have literally been everywhere! Hi Beth, I love it when nature does the cooking – it was probably the most memorable hot chocolate you've ever tasted. Your photo diary is beautiful and your account makes me want to visit for myself. This sounds like SUCH a thrilling experience. Definitely worth waking up for! I love the hot chocolate story! Getting up before the sun would definitely be worth it to see these geysers. Great pics and a cool way to make hot chocolate. Mmmmmm, that sounds heavenly! I've never seen a geyser, but I would love to one day. I miss living in the country. There was no light pollution and we could see so many stars…. 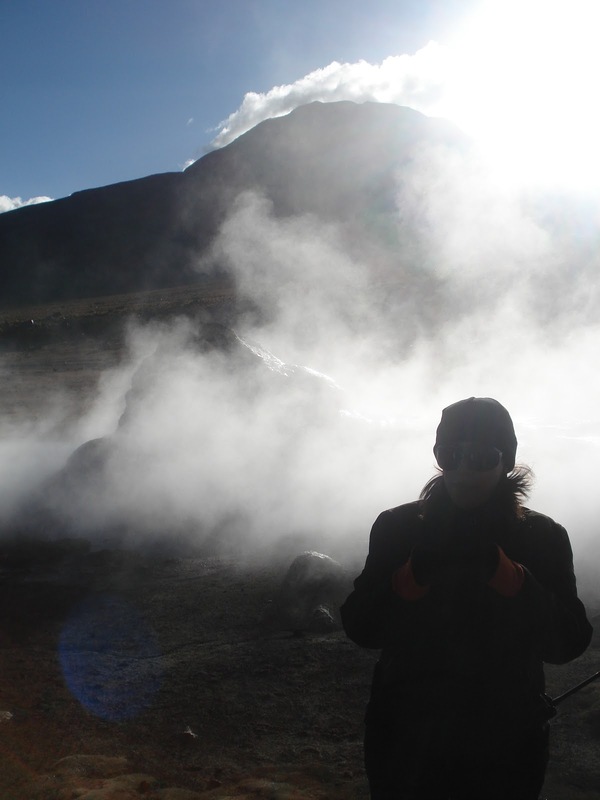 You certainly captured the mystical experience of witnessing these geysers well. The images of billowing steam and silhouette of a body are celestial. I would love to be there and see all these natural beauties even if I didn't have any time for sleep! Spectacular! While reading about your adventure, I was thinking this is something I would have have been brave enough to do when I was younger, but as I am now older, I am also more timid. Thank you for sharing this. Enjoy!